Karl-Heinz Rummenigge has given a clear indication that Bayern Munich plan to exercise their option to buy James Rodriguez. The Colombia international joined Bayern from Real Madrid on a two-year loan deal in 2017, with the agreement reportedly including a €42million clause to make the move permanent. 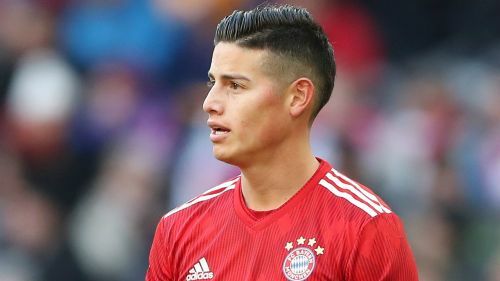 James has only started 10 Bundesliga games this season under Niko Kovac, but Bayern chief Rummenigge says he is confident the switch will be completed - and insists everyone at the club is in agreement on the 27-year-old. "I come out as a fan of James - he has an incredible left foot and, to me, is a world star," Rummenigge told Munchner Abendzeitung. "We have until June 15 to use the option, so we have plenty of time left. But I have to say that everyone is happy with him and I'm confident that James will be playing at Bayern again next season. "I'm sure Niko Kovac will be fine with it. He is now very happy with James." Bayern face Wolfsburg in the Bundesliga on Saturday before attentions turn towards the Champions League second leg against Liverpool. Kovac's men are waiting on the fitness of a number of key men, with David Alaba a doubt after missing their final training session on Friday. Alongside @ArjenRobben, Kingsley #Coman & @CorentinTolisso, @David_Alaba was also absent from training today. He completed an individual session.